By John F. McKenna (McJack): Former World Boxing Association (WBA) super welterweight Champion Shane Mosley (46-7-1-1NC, 39 KO’s) took his fight last May with WBO welterweight champion Manny Pacquiao (53-3-2, 38 KO’s) very seriously and prior to their match thought that he had a pretty good chance to pull off an upset. Once the fight began however Shane realized that he had underestimated the Filipino icon and after Manny floored him in the 3rd round he got on his bicycle and ran for the remaining 9 rounds. When Mosley fell to the floor he had a look of bewilderment and was obviously surprised at the power of Manny’s punches. Apparently Mosley nearly six months after his fight with Pacquiao is still baffled and puzzled at how much Pacquiao’s punches affected him and is still unable to come up with an explanation as to why. Most baffling to Shane is that he has faced fighters who have been bigger and stronger than “Pacman” and fighters who have been pretty good punchers. 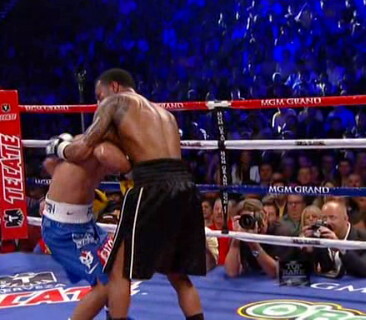 No one that he has faced however has been able to “wobble” him the way Paquiao did last May. According to reports after Mosley’s one sided loss to Pacquiao, Shane at one point asked trainer Nazim Richardson to halt the contest. Fortunately for Shane, Richardson would not halt the fight fearing that a stoppage would impact Mosley’s legacy.